A couple of weeks ago I came up with the amazing and revolutionary idea to make zucchini noodles. While I'm more than certain that many people before me have done this very thing, it still felt like my idea. :) While this post doesn't contain an actual recipe, I'm going to share with you how I made my zucchini noodles. Perhaps it will inspire you as well! I took my Pampered Chef julienne peeler (a birthday gift last year that I've used many, many times!) 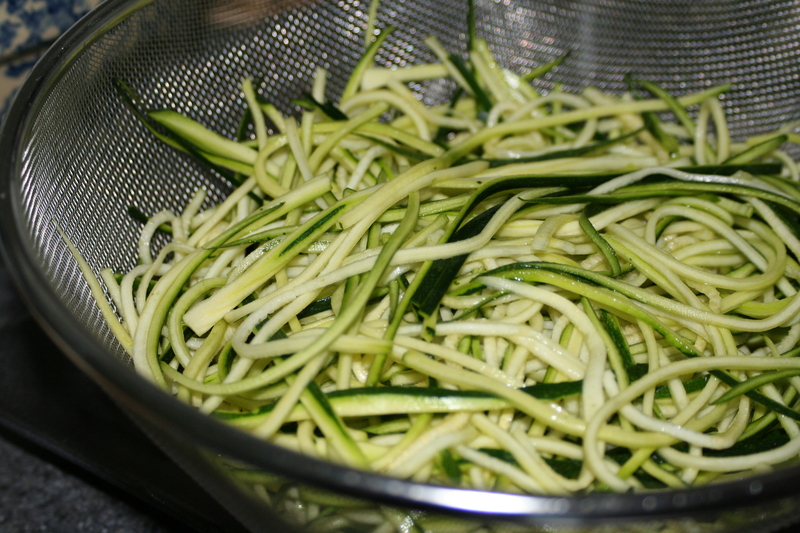 and cut down the length of a washed and trimmed zucchini, creating zucchini "noodles." Once I'd sliced all my zucchinis into noodles, I placed the lovely green pile into a fine mesh colander and salted them with about 1/4 teaspoon of sea salt (the salt draws out some of the water from the zucchini). Then I left it to drain for about 30 minutes, squeezing out the excess moisture before sauteing in a little butter and olive oil for about 5 minutes. I seasoned them with a little more salt, pepper, and Italian spices before topping the noodles off with caramelized onions, sauteed mushrooms, a little sausage, and marinara sauce. It was delicious! I might even like it better then the pasta. And, if you're a spaghetti noodle twirler, zucchini noodles will twirl around your fork too! If you too would like to make zucchini noodles and don't yet have a julienne peeler, I highly recommend you get one. :) It's a small gadget, but well worth the space it will take up next to your vegetable peeler. I also like to use it to matchstick carrots for salads or stir-fries (they cook up much more quickly!). MUST get one of those julienne peelers! Those noodles look and sound delicious!!! Heather, Alaina can very easily hook you up with one of those julienne peelers! It's such a wonderful tool. Planning on making these tonight! this site, and piece of writing is really fruitful designed for me, keep up posting these content. A number of them are rife with spelling issues and I to find it very troublesome to inform the truth on the other hand I'll surely come back again.